The Sunk Cost Fallacy refers to a decision that involves continuing to invest additional resources such as people, time or money into a situation due to a desire to not waste the already used, unrecoverable resources. Once a resource is spent and is nonrefundable, it is considered ‘sunk’. The Sunk Cost Fallacy tries to justify spending additional resources to try to recoup already lost costs. It is important for companies to recognize the natural tendency we all have to continue on the path we have already started off on instead of changing directions. This is a costly mistake we all make with various types of decisions. Even if we know the path is longer or more treacherous, we often feel an inability an unwillingness to abandon the path because there is a sense that we have already traveled too far to give up now. In terms of project controls and project management, the sunk cost fallacy appears when making a decision to further invest in a struggling or failing project. It can be an incredibly hard choice for project manager and/or stakeholders to cut their losses and move on, but more often than not that really is the best thing to do. The Sunk Cost Fallacy can also come into play when looking at project controls software. There are companies that have invested hundreds of thousands and even millions of dollars into developing their own in-house project management software solution, or in adding functionality to an existing commercial software product, or even spending months and sometimes years configuring a commercial software product to meet what they consider unique requirements. In these situations, organizations often lose sight of logic and continue to invest in substandard software solutions because they have already invested time, money and other resources into them. How can you determine if you’ve fallen into the trap of the Sunk Cost Fallacy? Simply ask yourself: Could I make more money or save time if I pulled out of my current endeavor and invest in a new one? If the answer is yes, it’s time to switch directions. Look into your project management software investments– Are you falling victim to the sunk cost fallacy? Maybe it is time to look at your options and discover what is best for your organization. If you are continuing to spend thousands of dollars on an in-house system or a customized solution, then maybe it is time to look at the ARES PRISM project life-cycle management software with built-in, ready-to-go functionality that can be implemented quickly so that you see a swift return on investment. 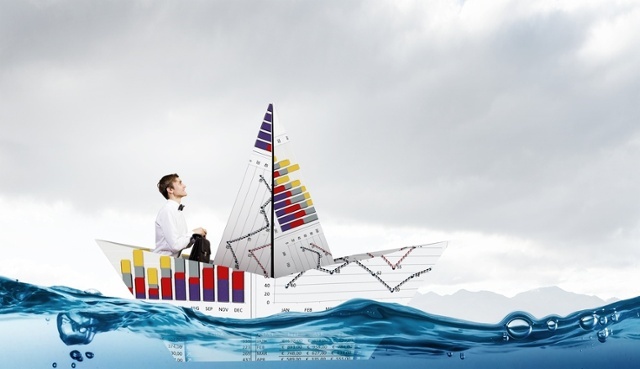 It may feel like a risk to abandon the sunk cost, but you certainly would not be one of the first few companies we’ve assisted in getting back on track and budget with ARES PRISM. 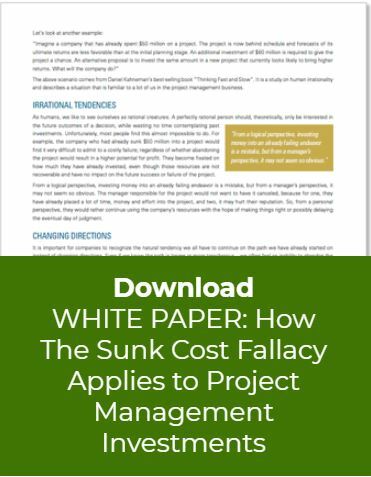 To learn more about the importance of sunk cost in decision-making download our WHITE PAPER: HOW THE SUNK COST FALLACY APPLIES TO PROJECT MANAGEMENT INVESTMENTS. 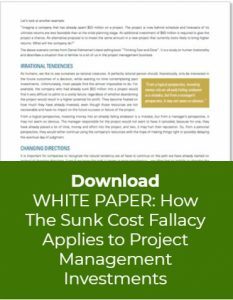 Our free white paper explores the Sunk Cost Fallacy and how it not only applies to projects, but also to project management investments. Do we ignore a better situation simply because we fear wasting the time or money we have already spent? Do we sink more cost into a failing project because otherwise it would mean admitting failure? Some companies have made significant investments into their project controls processes and tools only to realize that they are at a crossroads. While it may be tempting to include sunk costs in the decision-making process, it is important to recognize the associated repercussions.